QlikView is a new type of Business Intelligence (BI) software that changes your world. BI software that lets you stop guessing and start knowing how to make faster, smarter decisions. The QlikView Business Discovery platform is a user-oriented BI platform that assists in making decisions from diverse sources of knowledge, data, people, and the environment. The QlikView Business Discovery platform is an entirely new way to do BI. It is about helping people to share knowledge and analysis among individuals, groups and organizations. It provides information and analysis focused precisely on the business problems that people are trying to solve. Access, analyze, and capture data from mobile devices wherever you are. QlikView is the pioneer of In-Memory BI technology. In-memory is important for performance, but it takes much more to offer a Business Discovery platform. Traditional BI-based queries and cubes can run in memory with a faster response time, but they still need IT to manually maintain the data associations that users rely on. 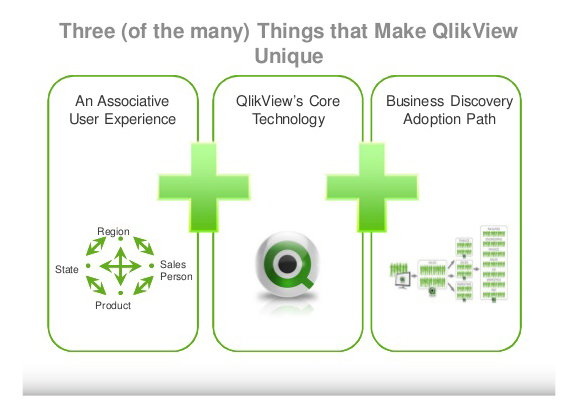 Watch more about Qlikview here. Inteligência estratégica na nuvem. Através de dashboards você vê além da informação, analisa comportamentos e tendências e tem insights estratégicos.